Here are some common heating and cooling terms and their definitions. Getting up to speed on industry terms will help you better understand your dealer’s proposal. ecoLogic: Frigidaire’s designation of green heating and cooling equipment. Learn More About ecoLogic. Heat Exchanger: The major part of the furnace that transfers heat into your home. Select a skilled contractor. When it comes to central heating and cooling, product performance and reliability greatly depend on the contractor's ability to design and install a system compatible for your home. Check out our tips on how to select the right contractor. Have an idea of what you want. Because heating or cooling purchases are infrequent, you may not be aware of the various product solutions that are available to correct common indoor comfort problems. If you do not speak up, the contractor may assume you are not interested in saving energy, lowering utility costs, correcting hot and cold spots in your home or a host of other solutions. The best way to purchase a system you will be most satisfied with is to identify all the things that you would like to improve on from your current system. Some contractors will ask you these questions, but some may not. Therefore, educate yourself what you want your system to do for you. An HVAC purchase is a long-term commitment, so now is the time to get the system that will satisfy your family's needs. You can do this by reviewing the questions below. •If you have high gas bills in the winter, ask about 95% furnaces or higher. •If you have high electric bills in the summer, ask about 15 SEER or higher. Would you like to reduce the amount of hot and cold spots in your home? •If there are hot/cold spots predominately during mild temperature days, then ask about your multi-stage options. •Basic two-stage systems rely on two stages of heating or cooling to give better comfort during mild temperature days. •Better two-stage systems use two stages of heating and cooling plus a variable-speed blower to provide more even temperature and fresh air in the home. •The best is a modulating system that offers a multitude of stages to provide the most precise temperature control and comfort. Not all manufacturers have indoor and outdoor modulating systems like Frigidaire. Do you want to control temperature by room? •Zoning systems are designed to allow the homeowner to control the temperature by room. You can zone as little as two areas or you can zone up to eight. The ability to zone your home, and the approach to zoning, may vary depending on both the home layout and contractor skill. Is it too humid in your home? Does it get too dry in the home? Do you have pets and the resulting dust and dander? Is dust a problem in your home? Q. What is Central air conditioning ? A. Central air conditioning, commonly referred to as central air (U.S.) or air-con (UK), is an air conditioning system that uses ducts to distribute cooled and/or dehumidified air to more than one room, or uses pipes to distribute chilled water to heat exchangers in more than one room, and which is not plugged into a standard electrical outlet. With a typical split system, the condenser and compressor are located in an outdoor unit; the evaporator is mounted in the air handler unit. With a package system, all components are located in a single outdoor unit that may be located on the ground or roof. When the air handling unit turns on, room air is drawn in from various parts of the building through return-air ducts. This air is pulled through a filter where airborne particles such as dust and lint are removed. Sophisticated filters may remove microscopic pollutants as well. The filtered air is routed to air supply ductwork that carries it back to rooms. Whenever the air conditioner is running, this cycle repeats continually. Because the condenser unit (with its fan and the compressor) is located outside the home, it offers a lower level of indoor noise than a free-standing air conditioning unit. Q. What is Air Handler ? A. An air handler, or air handling unit (often abbreviated to AHU), is a device used to condition and circulate air as part of a heating, ventilating, and air-conditioning (HVAC) system. An air handler is usually a large metal box containing a blower, heating or cooling elements, filter racks or chambers, sound attenuators, and dampers. Air handlers usually connect to ductwork that distributes the conditioned air through the building and returns it to the AHU. Sometimes AHUs discharge (supply) and admit (return) air directly to and from the space served without ductwork. Blower/fanAir handlers typically employ a large squirrel cage blower driven by an AC induction electric motor to move the air. The blower may operate at a single speed, offer a variety of set speeds, or be driven by a Variable Frequency Drive to allow a wide range of air flow rates. Flow rate may also be controlled by inlet vanes or outlet dampers on the fan. Some residential air handlers (central 'furnaces' or 'air conditioners') use a brushless DC electric motor that has variable speed capabilities. Q. 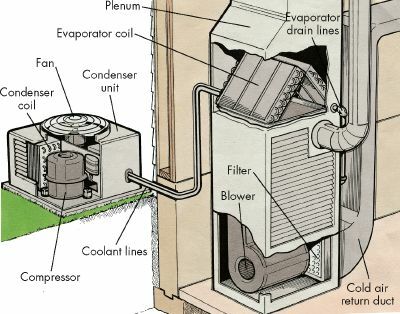 What is A Heat Pump ? A heat pump is a machine or device that diverts heat from one location (the 'source') at a lower temperature to another location (the 'sink' or 'heat sink') at a higher temperature using mechanical work or a high-temperature heat source.A heat pump can be used to provide heating or cooling. Even though the heat pump can heat, it still uses the same basic refrigeration cycle to do this. In other words a heat pump can change which coil is the condenser and which the evaporator. This is normally achieved by a reversing valve. In cooler climates it is common to have heat pumps that are designed only to provide heating. Heat pumps have the ability to move heat energy from one environment to another, and in either direction. This allows the heat pump to bring heat into an occupied space, or to take it out. In the cooling mode a heat pump works the same as an ordinary air conditioner (A/C). A heat pump uses an intermediate fluid called a refrigerant which absorbs heat as it vaporizes and releases the heat when it is condensed. It uses an evaporator to absorb heat from inside an occupied space and rejects this heat to the outside through the condenser. The refrigerant flows outside of the space to be conditioned, where the condenser and compressor are located, while the evaporator is inside. The key component that makes a heat pump different from an air conditioner is the reversing valve. The reversing valve allows for the flow direction of the refrigerant to be changed. This allows the heat to be pumped in either direction. Q. What Is A Condenser? What is a condenser? Many people have air conditioners but are not aware of how or what makes them work. A condenser is simply one component of an air conditioner. Whether you have an outdoor air conditioner or a window unit air conditioner your air conditioner contains a condenser. Condensers are used in outdoor air conditioning systems as well as heat pump systems. Condensers in an air conditioning unit have very few controls. They will have an on and off switch. Occasionally these air conditioners will also have a brown out option. This option shuts down the compressor when the electrical current is low. A condenser is simply a heat exchanger. It compresses refrigerants into a hot gas to then condense them into a liquid. A condenser is a major component in a air conditioning or heat pump unit. It moves air across the coils to facilitate the transfer of heat. In a heat pump unit the condenser has a few more features. It will have a reverse valve that allows the unit to switch back and forth between air conditioning and heating. Even when the unit is heating, it uses the condenser for defrosting the coils. If the coils become layered with frost it will effect the units effectiveness this is defrosted when the reverse valve switches to air conditioning mode to move the hot gases through the coils melting the built up ice. It will automatically switch back to heating mode once the ice is cleared to once again heat the home. It is very important no matter what type of unit you have to prevent the blockage of the condenser. If the condenser becomes block it can effect the units efficiency or even cause the until to completely fail. For this reason it is one of the most important components of a cooling or heating system. A condenser allows the maximum airflow to the unit. To keep your unit in good operating condition it is vital to keep the area around the condenser clear of all debris as well as keeping the filter clear of dust and dirt. A clean machine makes a happy machine. A happy machine will keep you cool during the summer months and warm during the cold months. It is suggested to change the units filters when they become dirty, depending on your area and conditions near your home this may be as often as once a month or as seldom as every 3 to 6 months. You will have to pay close attention to your units needs to decide the right time to change or clean your units filters. Keeping you condenser in good running condition will not only prolong the life of your heat or cooling system but also provide you with the most efficient heat and cooling system saving you money on heat and cooling. An air compressor increases the amount of air in a particular space. By packing in the air, the air pressure is increased which creates a force that is useful for a variety of purposes, from industrial and manufacturing to commercial and personal purposes. The original air compressor is the lung. When you take a deep breath to blow out your birthday candles, for example, you're increasing the pressure of the air in your lungs, which effectively is an air compressor containing pressurized air. You then use the force of the air in your lungs to blow out the flames of your birthday candles. Eventually, man-made air compressors were created. These fall generally fall into one of two types, positive displacement or dynamic, defined by its mode of operation. A positive displacement air compressor works by filling and then emptying an air chamber. Three common types of positive displacement air compressors are: reciprocating, rotary screw and rotary sliding vane. A dynamic air compressor, on the other hand, uses a a rotating device to accelerate and then decelerate air. This process uses the speed or velocity of the air to increase the air's pressure. Centrifugal air compressors are dynamic air compressors. Compressed air can be used in a variety of ways. It can be used to alter the chemical composition as in the case of making fertilizer or it can be used for industrial purposes like production line manufacturing processes or it can be used to maintain industrial plants. Perhaps the most well known use of the air compressor is in the case of pneumatic tools like air powered nail guns, staplers, sanders, spray guns, or ratchet wrenches. Air compressors can also be used to move debris. These tools are commonly available at hardware stores for purchase or rental. Another way to group air compressor types is by the number of stages it has. A two-stage air compressor is usually used for heavy duty use. This type of unit offers a higher level of compression than smaller, single stage air compressors. A two-stage air compressor can store air for future use, and is more energy efficient since it produces more air per unit of horsepower than a single stage compressor. Also, less heat is generated in a two-stage compressor, which means that wear on the unit is reduced. Portable electric air compressors are also available for light-duty applications. Depending on the type of air compressor, operation costs can be high, as in the case of plant maintenance. While air compressors can run on manual labor, like a hand powered air compressors, most run on either electricity or natural gas. It's the natural gas air compressor that is usually more cost-effective. If the air compressor is used in a small, enclosed area, an electric model may be more desirable in order to avoid gas fumes. The American Society of Mechanical Engineers (ASME) attests to the quality and protective features of air compressors. Their rating can be considered in evaluating air compressors for purchase or rental. In some states, only ASME-certified air compressors may be sold. Some safety features include a safety relief valve, which lets air escape if the tank's pressure exceeds the maximum. The air compressor should also have a belt guard for protection, and an enclosed air intake filtration system. As with all tools, proper safety should exercised when using an air compressor. When not being used, air compressors should be properly powered off and unplugged. Q. How important are clean and checks? A. All heating and cooling systems should be serviced every year by a heating and cooling professional. •Check for leaks, soot, rust, corroded electrical contacts and frayed wires. •Perform any necessary cleaning, including the burner and heat exchanger. •Inspect the venting system and verify that it is operating properly. •Check the operation of the compressor and outdoor fan motor. •Inspect the indoor evaporator coil for cleanliness and clean if necessary. •Inspect the furnace or air handler blower assembly for proper operation and cleanliness. •Check the refrigerant level in the system. Q. What should an HVAC technician check on my system? A. Replace your furnace filter at the start of every heating and cooling season. In environments with high dust or pets, ask your technician about the option of a high-efficiency air filter or electronic air cleaner that may need to be replaced just once a year. They work at least seven times better than a standard filter at removing dust and other particles. A. 1.If you have no electricity, your air conditioner will not work. Please call your utility company. 2.If you have a digital thermostat and it is not displaying a temperature, replace your batteries in the thermostat. A. 1.If you smell gas, please contact the gas supplier from your neighbor's phone. Do not light any appliance, touch any electrical switch or use a phone inside your home. If you cannot reach the gas supplier, please call 911. 2.If you have no electricity, your furnace will not work. Please call your utility company. 3.If you have a digital thermostat and it is not displaying a temperature, replace your batteries in the thermostat. 4.If the furnace is on, but no air is coming through the vents, call a technician for repair work. Buy the highest SEER you can afford. SEER stands for Seasonal Energy Efficiency Ratio and is a measurement of the efficiency of your cooling system over the course of a season. The higher the SEER rating, the higher the efficiency. Systems purchased to prior to 2006 were mostly in the 8 to 10 SEER range. In 2006, the minimum efficiency was raised to 13 SEER. Today, air conditioners such as the Frigidaire iQ Drive® system can be as high as 24.5 SEER. A 13-SEER system is 30% more efficient than a 10-SEER system, and a 24.5 SEER system is 145% more efficient than a 10-SEER system. Choose R-410A refrigerant. Most older systems used a refrigerant called R-22. In 2010, the new refrigerant standard became R-410A. R-410A is more environmentally friendly than past refrigerants because it does not deplete the ozone. Choosing an R-410A system means you may also have to replace your line set and your indoor coil, but you will be getting the maximum efficiency out of your new system. Identify the type of system you currently have. If you have an outdoor section and an indoor section, you have a "split system." The split system is the most common type of system. In the central United States and Canada, the indoor section is the coil box that sits on top of your gas or oil furnace. (Many homeowners think this is part of the furnace when it is actually the indoor section to the air conditioner.) The furnace blower is used to distribute cool air throughout the home. In very hot southern regions, the indoor section is typically an electric furnace or air handler. This product has the blower and coil inside a single cabinet. If you do not have an indoor section, you may have a "packaged" air conditioner. Packaged units are found in select regions. The packaged air conditioner contains the blower and coil components all within the outdoor section and may even provide gas heat or electric strip heat. Replace the entire system, not just the air conditioner. An air conditioner typically has two components -- the outdoor section and the indoor section as described above. It may be tempting to replace only the outdoor section. But in order for your system to achieve the efficiency you're paying for, you need to have a matched system that includes a new indoor coil. Additionally, old indoor components can adversely impact the performance of your air conditioner, and your new system warranty could be canceled if it was not installed with the proper indoor coil or air handler. Consider a heat pump. A heat pump works just like an air conditioner, cooling you all summer long. But in the fall and early spring, it can also provide cost-effective electric heat. Many homeowners are choosing a split-system heat pump over a split-system air conditioner and then pairing it with a gas furnace. This dual-fuel system can save you a lot of money because you heat with electricity when the weather is mild and with gas when the temperatures dip below freezing, so you are always using the most cost-effective fuel source to heat your home. If you have a packaged system, there are also dual-fuel packaged systems that combine heat pump and gas heat technology. Don't skimp on the install. With a heating and cooling system, the installation is absolutely critical to performance. Make sure you hire a certified contractor who is going to address your ductwork and other home needs in addition to replacing equipment. A quality installation will cost more upfront, but it will save you in service and headaches down the road. Think about comfort. Many of the higher-end air conditioners include extra features that will dramatically improve your home's comfort. Two-stage systems can run at a high and low stage, so they are quieter and provide a better mix of air throughout the home (no hot and cold spots). Also look for noise reduction features such as compressor sound blankets and swept-wing fan blades. Imagine not having to turn up the television when the air conditioner kicks on. Q. What is difference between 410A & R-22 refrigerant ? Q. What type of air conditioner do I have? A. Identify the type of system you currently have. If you have an outdoor section and an indoor section, you have a "split system." The split system is the most common type of system. In the central United States and Canada, the indoor section is the coil box that sits on top of your gas or oil furnace. (Many homeowners think this is part of the furnace when it is actually the indoor section to the air conditioner.) The furnace blower is used to distribute cool air throughout the home. In very hot southern regions, the indoor section is typically an electric furnace or air handler. This product has the blower and coil inside a single cabinet. If you do not have an indoor section, you may have a "packaged" air conditioner. Packaged units are found in select regions. The packaged air conditioner contains the blower and coil components all within the outdoor section and may even provide gas heat or electric strip heat. Q. How to select the right contractor ? Know what to ask the contractor. Because heating or cooling purchases are infrequent, you may not be aware of the various product solutions that are available to correct common indoor comfort problems. If you do not speak up, the contractor may assume you are not interested in saving energy, lowering utility costs, or correcting hot and cold spots in your home. Check out our tips on what questions to ask. Select a skilled contractor. When it comes to central heating and cooling, product performance and reliability greatly depend on the contractor's ability to design and install a system compatible for your home. Here's how to make sure you are selecting the right dealer for your new heating and cooling system. An appropriately sized system that is also installed correctly is critical to performance and your happiness. •Check to see if the dealer possesses all of the appropriate licensing for installing HVAC equipment in your state and local area. •Review the dealer's listing on the Better Business Bureau. •Ask how long they have been in business and if they offer 24/7 service, financing or accept credit cards. •A dealer coming into your home should do more than just inspect your existing system. Follow the dealer around to see if he or she is checking air flow, inspecting the duct system, making note of the windows and the direction your home faces, etc. •Be wary of anyone who quotes you a price on the back of a business card after being in your home for a few minutes, or even over the phone. •A knowledgeable dealer that has your best interest in mind will ask about your experiences in the home -- how long you have lived there, how long you plan to stay, if you have pets, allergies, smokers, hot and cold spots and noise. •A dealer with the tools to address these problems will offer viable solutions such as air cleaners, zoning equipment, programmable thermostats, humidifiers, variable speed and two-stage technology. If they do not offer these solutions, they may not be the right dealer for you. •It takes more time to complete an installation when done correctly. Expect to pay more for comprehensive service, but much less in the long run for your system's performance and maintenance. •Typically, manufacturer warranties cover the replacement of faulty components for a limited time. Failure due to poor installation is typically not warranted by manufacturers. Select a dealer who will do a good job the first time and be around to assist you as needed. Q. What you can expect from your contractor ? •Selecting the type of system and equipment (plus operating and safety controls) that are compatible with the architecture of your home, fuel availability, fuel costs, the space available for equipment and duct runs, appearance issues and project cost. •Calculating energy savings with a new system. You may find that investing in a new energy-efficient system with yield monthly savings greater than money earned on a CD investment or savings account. •Performing load or sizing calculations for each room and the load on the central unit(s). New homes are better insulated and do not have the same capacity requirements as older homes. Over-sizing a unit can contribute to uncomfortable temperatures and inefficient performance. •Using the proper industry manual procedures and manufacturer's data to select, size and place equipment, supply outlets, ducts and returns. •Installing to local, state and federal codes and utility regulations. •Installing the indoor and outdoor equipment. A split system is the most common installation. •Installing supply air outlets and returns if they do not exist or are inadequate. •Installing duct runs (must be sealed and insulated to R-6 or R-8 if in unconditioned space) if they do not exist or are inadequate. •Installing control system(s), such as thermostats and/or zoning controls. •Installing furnace gas piping and vent (if applicable). •Checking all power supplies, connections, fuel trains and vents. •Measuring and adjusting air flow at the unit and at the rooms (balancing work). •Educating the homeowner about the system and equipment (provide all instructions and manufacturer's documents, including warranties). How does the heat work In central Air conditioners as Heat Pumps? What's the best way to ensure that the central air-conditioning system you choose is installed properly, and will provide the most efficient and reliable cooling for your home? The pointers below can help you to find the right hardware and the right technician to install your system, whether you're replacing an older air conditioner or installing one for the first time. The information comes from our experts. And while there's no one money-saving strategy that will work for everyone all the time, there are simple steps that you can take, as we show in Keeping costs down. In some cases, you may be able to cut back on air-conditioner use considerably without seriously inconveniencing your family. In a "split system," the typical design, refrigerant circulates between an indoor coil and a matching outdoor condenser with compressor. The refrigerant cools the air, dehumidifying it in the process; a blower circulates air through ducts throughout the house. A variation is the "heat pump," a type of system that functions as heater and cooler. When used as an air conditioner, a heat pump discharges heat from the house either into the air or deep into the ground. In the winter, a heat pump extracts heat from the ground or the air to warm the house. A synonym for the air conditioner's cooling capacity, size is measured in British thermal units per hour (Btu/hr.) or in "tons." One ton of cooling equals 12,000 Btu/hr. Seek referrals from neighbors, family, or business associates. It's wise to get price quotes from at least three contractors. Contractors who bid on your installation should show you proof of bonding and insurance, plus any required contractor's licenses. Check with your local Better Business Bureau and consumer affairs office for complaint records. It's a plus if technicians are certified by a trade organization, such as North American Technician Excellence or HVAC Excellence, to service residential heating and cooling equipment. These and other similar programs assess the technician's knowledge of specific types of equipment and its proper service methods. We believe that a contractor who has made the effort to get certified and has practiced this trade and learned from several years of service and installation experience, will be a better service provider. Contractors who bid on your job should calculate required cooling capacity by using a recognized method like the Air Conditioning Contractors of America's Residential Load Calculation Manual, also called Manual J. An additional reference for assessing ductwork needs is Manual D. The calculations produce a detailed room-by-room analysis of cooling needs. Ask for a printout of all calculations and assumptions, including ductwork design. Be leery of a contractor who bases estimates merely on house size or vague rules of thumb. A service plan that combines regular inspections with discounts on repairs and a labor warranty is worth negotiating into the overall price. Prices for such service vary widely. Replace filter monthly or as recommended by the manufacturer. If you're replacing an old central-air system, you can expect to pay around $3,000 for the equipment. If you need ductwork installed because you're starting completely from scratch or are upgrading a forced-air heating system, expect to pay $6,000 or more. Improving the system's air-filtration capabilities is also easiest to do as part of a general upgrade. Brand plays some role in the selection. Matching new equipment with old. If you replace only the condenser, you have a "field-matched" system that can be less efficient than advertised and that may require more repairs because of undetected incompatibilities between the two. Damper-zoned cooling. A large or multistory house is often divided into several heating and cooling zones to improve temperature control. However, this type of system is complex and has many more moving parts and controls and so may require more repairs. HOW TO MAINTAIN CENTRAL DUCT AIR CONDITIONING SYSTEM? Tips for Buying or Upgrading your Central Duct Air Conditioning System. If you've been thinking of upgrading your old central air-conditioning system, or installing central air in a house that has never had it, there's a lot to consider. Every manufacturer today offers a wide range of products, with one suited to nearly every situation. A few even make systems for houses that won't accommodate conventional ductwork. As you might expect, the two most important considerations are efficiency and cooling capacity, but there's more to it than buying the biggest, most efficient system you can afford. In fact, there's quite a bit more. Central air conditioning is, of necessity, a split system, with some components installed outdoors and others indoors. The heaviest, noisiest, heat-shedding components–the compressor and condenser coil–are installed outdoors, while the evaporator coil is installed indoors, usually in the form of an A-frame in the plenum of a forced-air furnace. In this case, the furnace's blower moves warm air over the coils and distributes the chilled air. The indoor and outdoor segments of the system are typically joined by two refrigeration lines and a low-voltage relay cable. If a home is heated by some means other than forced air–baseboard or radiant floor heat, for example–the evaporator coil is typically mounted in a dedicated blower unit, which pushes the cooled air through conventional ductwork. Most blower units are installed in attics and crawlspaces and are connected to flexible, insulated ductwork, which is the easiest and least costly to install, especially in retrofit situations. In houses built without ductwork, and where conventional ductwork would be too costly or too inefficient to install, a ductless central-air system is now possible. Ductless systems have long been popular in Europe and Asia, where building methods discourage ductwork, but are relatively new in the United States. The Carrier Corp. is one of several companies now making ductless systems for the U.S. market. In these systems, a single outdoor compressor serves several, smaller evaporator coils located indoors, each in its own box and each with its own blower fan. These components are installed on exterior walls, usually on the upper half, where much of the heat accumulates. They're finished unobtrusively, but they can be quite large, often measuring 6 x 18 x 24 in. Condensation lines are routed outside, along with the refrigeration and electrical lines. Ductless systems can also provide heat, either through resistance coils in the wall units or in heat-pump fashion. The advantages of ductless air over window air are that ductless systems move the noisiest components outdoors, they can provide heat, they distribute the air more evenly, and they don't block the better half of a window. Installation costs vary widely, but ductless systems can be more expensive than ducted systems. It's a sliding scale, with each home's variables–primary building material, number of rooms, house size and layout–coming into play. They're reliable and efficient, but they're not likely to replace ducted systems in the United States. They're considered problem solvers, with the problem being fairly rare. All heating and cooling technology grows from the law of thermal dynamics that says when hot and cold spaces are separated by a medium, the transfer through the medium will always be from hot to cold. Heat follows cold, whether the medium is human skin, an exterior wall or the metal surface of an evaporator coil. When warm, humid air is blown across the evaporator coil in your furnace, the heat in the air is drawn to and impinges on the cold metal surface of the coil's fin tubes. In the process, the moisture in the air condenses on the cold metal and drips into a pan below the coil, where it's drained off, thus lowering the humidity in the house. It's a neat trick–a double trick–but it requires a repeatable cycle, over and over, every time the system's thermostat demands it. The evaporator coil needs to be constantly recooled and the heat it absorbs needs to be carried outdoors. This is accomplished with a liquid/gas refrigerant, which undergoes a pressure-induced state change. An outdoor compressor pressurizes the refrigerant, heating it to a gas state, then sends it through an adjacent condeser coil to be cooled and returned back to the evaporator coil. There it picks up household heat and carries it back to the compressor. When this cycle is repeated often enough, our homes become a lot more comfortable. How are systems rated? Central air conditioners–the condenser units–are given a Seasonal Energy Efficiency Rating, or SEER. In simple terms, SEER is calculated by dividing the cooling capacity of a continuously operating air conditioner by the electrical input required to run it. The value is expressed in numbers. A SEER 10, for example, is now the lowest number allowed, and any number larger than that is accordingly more efficient and will cost less to operate. Along with the yellow Energy Guide tags attached to each appliance, these ratings give consumers a benchmark sense of where their choices fall on the energy-efficiency scale. Most manufacturers now offer SEER 10, 11, 12 and 13 models, and some offer SEER 14. This gives you five separate efficiency options, with model numbers usually keyed to the SEER numbers, so they're easy to recognize. Lennox's Value 12 system, for example, is a SEER 12. Like the auto industry in its quest for better mileage, cooling equipment manufacturers have combined some minor tweaking with some major re-engineering. Because the compressor is the biggest energy user, that's where they have focused much of their attention. The first step was to improve the internal components of standard, reciprocating compressors, so that less pressure–and therefore, energy–was lost to internal leaks. Another step was to increase the size of the condenser coil. With more fin-tube surface area, the returning refrigerant could be brought to the compressor with less heat, reducing the compressor's load. These two steps yielded substantial savings, bringing condensers into federal compliance, but a complete retooling was needed to achieve significant improvements beyond this level. Part of the answer was a multispeed compressor. With two or more speeds, the system doesn't have to run full out on days when only mild cooling and dehumidification are needed. Full-speed use is still available for those really miserable days, but the compressor doesn't have to run wide open all the time. At low speed, the practical effect is that of a small compressor matched with an oversize condenser coil. The savings can be substantial and most manufacturers offer multispeed compressors in their lineups. At the same time, engineers began testing a radically different kind of compressor–the scroll. Scroll compressors are so different that they practically defy description. But their mechanical advantage is clear. Because they generate much less friction, they experience much less wear. The final product is a compressor that is very efficient and lasts longer. Today, most companies offer some multispeed and some scroll compressors, though a few, like Ruud/Rheem, have gone to scroll compressors exclusively, as a statement of across-the-line quality. Any way you look at it, today's condenser units are better than those made just a few years ago. So where does this leave the tens of millions of us with Freon-based, R22 systems? The short answer is that the Freon phaseout is stretched so far into the future that nearly all of today's air conditioners will have been replaced by then. The EPA will require a substantial reduction by 2004, and all products containing R22 must stop production by 2010. The production of R22 itself must cease by 2020. For those few R22 units still in service at that time, recycled R22 will be available, though it will probably cost a small fortune. Your heating, ventilation and air-conditioning (HVAC) contractor will size your equipment to meet the specific needs of your home. Factored into the equation will be the age of your house, the number and quality of its windows, how well it's insulated, how many stories it has, its size, and, of course, local energy rates. Contractors use industry sizing models, such as Model J, but most use them as a reference, modifying the results to accommodate their own years of experience. A 1500-sq.-ft. ranch-style home, for example, might normally require a 2 1/2-ton air conditioner, but if it's not well insulated, or if a good many windows have western exposure, or if the trees offer little direct shade, then a 3-ton unit might be more appropriate. What do air conditioners cost, installed? Again, local prices will vary significantly, but in a typical Midwestern town, a nonunion shop might charge between $1200 and $1700 to replace an old, 3-ton air-conditioner with a new SEER 10 system. That's assuming a 1500-sq. ft. house, 20 years old, with ductwork in place. For a similar home that's new, with a gas furnace and equivalent air conditioning, the price would be $5000 to $7000, gas and electrical connections included. All we can do here is provide some context. If, for example, your electricity costs you a low 6 cents per kilowatt-hour (kwh), and you live in a reasonably well-insulated home in the northern one-third of the nation, using your air conditioner 200 to 400 hours per year, a basic SEER 10 system is probably your best choice. There's little chance that you'd recover the several hundred extra dollars a SEER 11 or SEER 12 system would cost, spread over a 12- to 15-year projected service life. You may hope for longer service, and you'll probably get it, but don't count on it. A SEER 10 is also a reasonable choice if you plan to move in the next few years. On the other hand, if you live in Yuma, Ariz., and run your air conditioner 2000 hours per year, then it makes sense to buy the most efficient model you can afford. The same might be true if you live on the Eastern Seaboard and pay 11 or 12 cents per kwh, or if you live in a house with stone or brick exterior walls, where insulation is simply not feasible. In these cases, high efficiency really is a good investment. Most manufacturers offer two quality levels for each SEER number. What you get in return is a better-made unit that runs three to six times quieter and lasts longer. A quieter-running unit can be a real plus if you–or your neighbors–are particularly annoyed by a loud air conditioner. You'll also get a better warranty: a 10-year compressor warranty instead of five, a 5-year warranty against leaks in the coils instead of one year. As with all step-up warranties, you're betting against yourself, which sometimes pays big dividends. If it paid more than about 40% of the time, however, the manufacturer couldn't afford to offer it. It takes more than a few figures and a form online to thoroughly assess central air prices. There are several factors that will directly affect the size of the unit you need, what you’ll be spending up front, and ultimately what you’ll be shelling out from month-to-month. Central air conditioner prices go beyond the initial cost of the unit itself, and all of these factors should be considered when price shopping for a new air conditioning system. The best way approximate your home cooling needs is going to be doing a load calculation, or heat-gain calculation. The Air Conditioning Contractors of America’s Manual J Residential Load Calculation includes everything from the obviously practical to the commonly overlooked elements of home cooling, so it’s a great rubric for determining prices of central air. The size of the area being cooled is an obvious factor when it comes to sizing your potential AC unit. The square footage of your home will directly affect your home cooling needs. The size and position of windows and whether they have shading contributes to the insulation in your home. If your home is well insulated, you’ll have less need for a larger central air system. The number of occupants changes both heating and cooling needs. A full home will generally be warmer, thanks to natural body heat. A larger house with fewer people might need a little boost to keep things cool. Home appliances and electrical equipment create heat. If your home is filled with heavy appliances and strong lights that are often left on, you may need a stronger central air conditioning system to combat the heat that they create. The more energy efficient your central air conditioning system is, the more expensive the unit itself will be. The SEER you aim for depends highly on the results of your load calculation, your regional needs, and how much you’re willing to spend on the future efficiency of your central air conditioning system. What is the difference between a condenser and compressor unit? For home units, the compressor is the outside, large box shaped unit that is usually on the side, or behind the house. It takes the freon gas from inside the home compresses it into a liquid, where it will be pumped back inside to the condensor. Compressing gas creates heat, so a fan draws air through the cooling coils on the side of the unit, and blows it out the top. It is important that these coils are kept clear of debris, and should be periodically sprayed off with a hose to knock off dust that may have accumulated. Now that the freon gas is compressed, it gets pumped inside the house to the condensor, where the pressure falls, allowing the freon to return to a gas. This creates an endothermic reaction, drawing heat from the air. The condensor unit has a series of coils with fins that get very cold. The warm air in the house is blown over these coils, cooling it, and then through the ductwork of the house, and out through the registers. The air conditioning compressor motor is a pump which draws sensible heat laden refrigerant gas from the building's indoor components (evaporator or "cooling coil" in the indoor air handler) through the larger diameter refrigerant suction line into the compressor where that pump compresses the low pressure refrigerant gas to high pressure and higher temperature. Raising the coolant (refrigerant) temperature above outdoor ambient temperature causes heat to flow from the coolant (flowing out of the compressor and through the outdoor A/C condenser coil) into outdoor air. (Heat always flows from warmer to cooler substances). Sketch courtesy of Carson Dunlop. As we explain at THERMOSTATIC EXPANSION VALVES, it is the flow restriction provided by a cap tube or by a TEV in the refrigerant piping system that allows the A/C compressor pump to raise the system pressure and thus increase the temperature at which the coolant changes state. In other words, the TEV or cap tube allows the compressor to reduce refrigerant pressure on the LOW side of the metering device and raise refrigerant pressure on the HIGH side of the metering device. Incidentally, A/C compressors can only accept and compress refrigerant in gas form. In fact the refrigerant vapor is superheated to be sure that there is no liquid at the pump - lest the pump be damaged. If liquid refrigerant were to flow into the compressor motor it would most likely cause catastrophic damage. The high pressure high temperature refrigerant gas leaves the outdoor compressor and enters the outdoor condensing coil where it is cooled to a liquid state by the condensing unit fan that blows outside air across the condensing coil or by immersion of the condensing coil in cooling water in some designs.The heat produced in these steps is transferred to the outside by a fan which blows outside air across the condensing coil. The liquid refrigerant is then able to return to the indoor components for cooling and dehumidifying the building interior. What are the Components of the Outdoor Portion of a Central Air Conditioning System - the Air Conditioning Compressor Unit? The Air Conditioning Compressor Itself - on residential units the A/C compressor motor is most often a hermetic motor-compressor combined in a single sealed unit like the Carrier™ unit shown at left. You cannot actually see the individual A/C compressor parts because at least on residential air conditioners or heat pumps, the entire assembly is enclosed. Sketch from Carson Dunlop. If a ductless split-system air conditioner is installed an outside compressor unit is still required, typically looking like the Sanyo™ unit shown at the top of this page. If a "portable" indoor air conditioner is in use, all of these parts may be inside of a single portable cooling unit, usually mounted on wheels. Portable air conditioner units use a duct and fan system to blow to outdoors the heat that has been extracted from indoor air. Window air conditioners also contain all of these parts in a single unit, but by hanging the window unit in a window or in a wall opening, the device has ready access to outdoor air into which it ultimately is transferring heat from indoors. How does an air conditioning compressor motor work? The job of the compressor/condenser unit is to recompress warm refrigerant gas (pulled from the indoor air handler cooling coil) back to a liquid refrigerant that can be returned to the indoor cooling coil once again. When the room thermostat calls for cooling, both the indoor blower or air handler and the outdoor compressor/condenser begin to work. Control circuits and a contactor relay turn on the outside compressor/condenser motor and its outdoor cooling fan as well. The air conditioning or heat pump compressor compresses the incoming refrigerant to a high pressure gas and moves that gas into the condensing coil described just below. Typically a piston moves up and down inside of a cylinder inside the compressor motor, drawing in refrigerant gas on the down stroke of the piston, and compressing the refrigerant gas on the up stroke of the piston. (Some refrigeration compressors such as those made by Frigidaire™ used a rotary compressor design that we found durable and powerful enough to lead us to salvage and re-use these motors for other purposes. The refrigerant gas leaves the compressor at high pressure and at high temperature (since compressing a gas will raise its temperature). In most air conditioning or heat pump compressors, a piston moves up and down to draw in and then compress refrigerant gas, moving refrigerant vapor from the incoming low side to the outgoing high side of the compressor. The refrigerant gas leaving the compressor (and entering the condensing coil) will contain both heat that the refrigerant absorbed at the evaporator coil (heat from air in living space of the building), and additional heat produced at the compressor by the process of compressing the gas. The refrigerant gas is thus heat laden with sensible heat (heat that we can measure) from the living area and compressor heat from the compressor motor. Air conditioning and refrigeration compressors use a special oil which does not react with the refrigerant liquid or gas in the system. The oil may mix and travel with the refrigerant however, and some cooling systems are designed for deliberate movement of the compressor oil in order to lubricate some parts such as refrigerant metering valves or compressor valves. The larger diameter refrigerant suction line connects the indoor evaporator coil outlet to the compressor inlet. The larger refrigerant line (located on the low side of the system) reduces system pressure and causes vaporization of the refrigerant (so that sensible heat is absorbed and the suction line feels cool to the touch). Refrigerant returning to the compressor from the evaporator coil and through the refrigerant low pressure suction line, is in the form of a low pressure, low temperature gas. Most air conditioning compressors are designed only to pump gas vapors, not liquid refrigerant (which could damage compressor internal parts). The refrigerant gas entering the compressor at its inlet port is said to be heat laden, that is, it was at a low-enough temperature to have absorbed heat from the evaporator coil in the living area. The smaller-diameter high pressure refrigerant lines connect the compressor outlet and the condensing coil inlet and also move refrigerant liquid in it's cooled, condensed and now liquid state from the outlet of the condensing coil to the thermal expansion valve (basically a refrigerant metering device) and the evaporator coil inlet in the air handler unit in the building. This smaller (in diameter) refrigerant piping or tubing (located on the high side of the air conditioning system) reduces volume and thus increases pressure and temperature in the lines (so that sensible heat can be transferred to ambient outdoor air or water if a water-cooled air conditioner system is in use). Service valves or ports are usually present on the refrigeration lines near the compressor. to permit testing the condition of the air conditioning system and permit removal, replacement, or additions to the refrigerant in the system. What is Condensing coil ? Condensing coil receives high pressure refrigerant gas from the compressor and cools this refrigerant gas back to a liquid state. Outdoor cooling fan moves outdoor air across the condensing coil to cool it and assist in condensing the high pressure, high temperature refrigerant gas back into a liquid. It is this process which completes the transfer of heat through the refrigerant from indoor air to outdoor air as the compressor/condenser unit compresses and then cools the refrigerant back to a liquid.